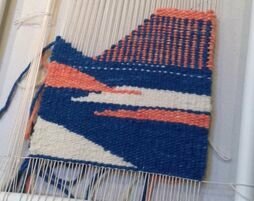 Join Sunshine Coast textile artist Janna Vallee of Everlea Yarn to learn tapestry weaving techniques. Tapestry weaving is a great craft for creating home decor, place mats, and small gifts using yarn ends from your stash. You'll leave the workshop with a solid understanding of the process of warping up and weaving, shape building and colour blending. Discover how to choose yarn for your projects, and how to troubleshoot challenges. Students will make a good start on a sampler wall hanging using their choice of Janna's naturally dyed yarns. Fee includes a wooden frame loom (or Mirrix Loom at additional cost), warp yarn, naturally dyed wool weft yarn, and a 14-page hand-out. Students are welcome to bring their own loom with permission from Janna (contact Janna at janna@everleayarn.ca to discuss the loom you’d like to bring). ​Students should bring a pair of scissors.